The script for Meet Me At Dawn never takes itself too seriously despite weaving a deeper story about love, loss, false hopes, what-ifs and if-onlys. By LESLEY STONES. Sand beneath your feet isn’t what you expect when you enter a theatre. It’s a quick way to get your attention though, as you crunch towards your seat and realise that a stage at the Market Theatre has turned into a deserted island. Soon two women wash up, gasping, retching, and shivering, then one of them leaps into a joyful frenzy at the miracle of being alive. That’s how Meet Me At Dawn begins, a gorgeous play by British writer Zinnie Harris brought to exuberant life by Pamela Nomvete and Natasha Sutherland. There’s a riddle to the play that I sit there trying to solve, as do the two characters. A niggling, Waiting For Godot style puzzle of who they are, where they are and crucially, what they’re doing there. Something going on below the surface, beyond the bare facts of two incompetent sailors who were larking around on a boat when it capsized. Nomvete plays Robyn, the short, practical, stable, thinking type, and Sutherland plays her girlfriend Helen, her polar opposite in looks and temperament. She’s a tall, skinny livewire, bouncing around and making plans while Robyn ponders. Both actors give wonderful performances, supporting and enriching each other beautifully. It’s directed with gleeful exuberance by Lesedi Job, and that sandy set design by Hailey Kingston is another winner. The only flaw is that when both women are huddled right at the front of the stage, the audience further back are bobbing about to see them. The script is poetic, tender and funny, and never takes itself too seriously despite weaving a deeper story about love, loss, false hopes, what-ifs and if-onlys. 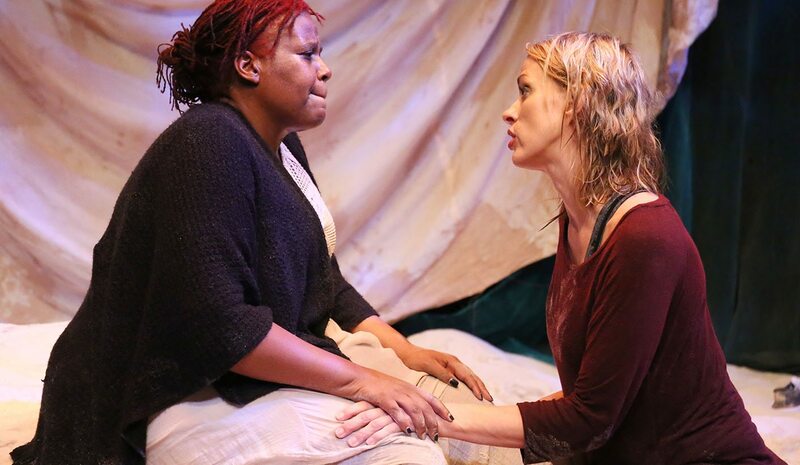 We’re all guilty of that, and this play will resonate with anyone who’s lost a lover. Well, isn’t that the whole damn world? Nomvete has some of the most marvellous lines and delivers them with a raw power, not afraid to bare her soul to anyone who holds a ticket. Her achingly sad but fiery rage against the universe will bring you to the point of tears, before this clever script snaps you back to an instant laugh. Meet Me at Dawn runs at the Market Theatre until 15 April. Tickets from Webtickets.